Do you see these small insects on your plants? With daytime temperatures warming and nights remaining on the cool side, conditions are perfect for an outbreak of pests to hit the spring garden. 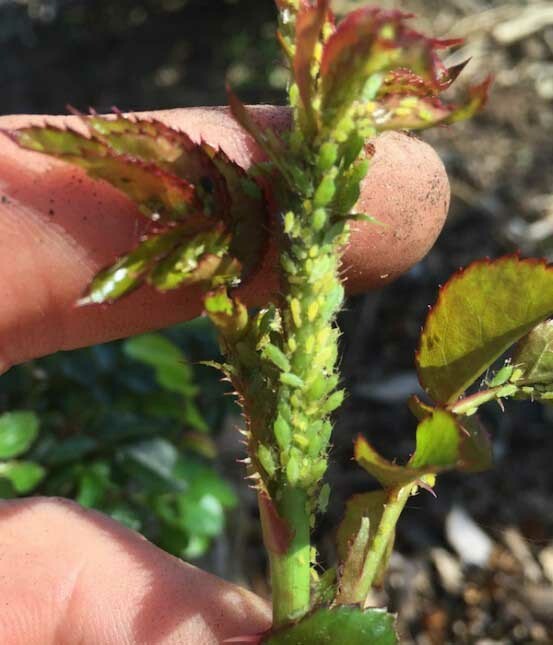 As your roses leaf out and tulips are blooming, the tender tissue is highly attractive to pests like aphids. Keep your eye out for these little suckers on your newly emerging garden plants and shrubs right now! We’re seeing them on roses all over town. Need help identifying aphids and other pests in the landscape? Bookmark our Pest ID Guide. The key to keeping the landscape pest free is early detection and a long term maintenance plan. Aphids were ALL OVER one of my lemon trees, covering leaves and blossoms alike. I hit them with NEEM oil. Is there anything else I should do? Where’s a group of ladybugs when you need ’em? Hi Karin – keep an eye out for more aphids, as a new generation will probably pop up from the eggs laid by the aphids you treated. You may need to treat again in about a week or so. Horticultural oils are a good way to deal with aphids. You might consider picking up some ladybugs at your local garden center and releasing them – however, know that if you apply more horticultural oil it will kill the ladybugs too!